BenQ W1090 review | What Hi-Fi? 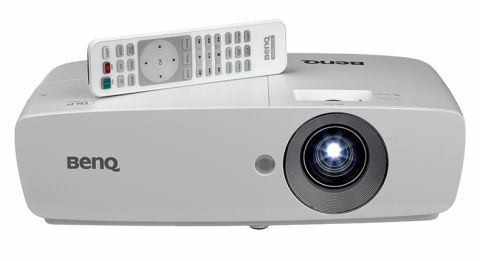 BenQ has had a good run of sub-£1000 projectors, with four- and five-star reviews peppering its range in the past couple of years. Its recent efforts missed out on a Best Buy at the 2016 Awards, but there’s no doubt that if you’re in the market for a budget projector, BenQ is one of the companies to look out for. The new BenQ W1090 proves this. With its compact size, short throw ratio and big picture (100cm from 2.5m away, says BenQ), this DLP projector is perfect for those with small rooms and home cinema fans on a restricted budget. Crisp edges, glossy detail and an exuberant way with colours means that the BenQ W1090 pleases from the start. Play Star Trek Beyond on Blu-ray and the W1090 delights in delivering the special effects with vibrancy. Starfleet uniforms are solid and the pristine interiors of the USS Enterprise shine brightly, with stark whites and gleaming metal bursting from the screen. Black levels are deeper on the BenQ W1090 than its £600 Epson EH-TW5350 and ViewSonic LightStream Pro7827HD rivals. This gives a pleasing solidity to scenes, especially when you can see pinpricks of stars twinkling against the vast expanse of space. But we want it to go brighter, and to have more subtlety throughout. While the BenQ’s black depth is commendable, it doesn’t make the punchy areas go any brighter than its rivals. It’s obvious when you look at any scene containing a bright light source, a lens flare or natural sunlight through a windowpane. The way the light falls upon characters’ faces should vary in intensity and brightness – here it looks subdued and uniform. The Award-winning Epson handles colour gradations and finer detail with more accuracy, giving a more lifelike quality to films such as The Imitation Game. The W1090’s colours are bold and attractive, but a touch overdone. Whether that’s the artificial-looking green grass, the wooden furniture that looks too polished, or skin-tones that are a bit too flushed, the colour palette could do with some of the restraint and subtlety found on the Epson. To calm down that effusive quality, we play with ‘Brilliant Colour’ in the settings and set the colour temperature to ‘Cool’. Our biggest complaint remains that you can’t adjust the colour settings of the BenQ when connected via HDMI, as it would be helpful to tone down the overly rich picture. There’s a hint of noise creeping into the Full HD picture, too. And while some projectors have trouble with smooth motion in long panning scenes, the W1090 struggles when characters move their heads or walk around a table. The built-in speakers are appreciated, but the wispy sound is nowhere near fulfilling, and certainly not a patch on the sound you’d get through a speaker package or a soundbar. Elsewhere, the W1090’s build quality is solid, and we like the smart matt-white finish. It’s a nice change from the glossy finishes of projectors such as the Epson EH-TW5350. The compact and lightweight build means you can position the W1090 anywhere in the room or ceiling-mount it. The lens light bleeds through the side vents of the projector, which can be distracting if it’s placed in front of you. Manual focus and zoom adjustments are easy to use and we have a perfectly centred, large image in mere seconds. Three adjustable feet underneath help with positioning, too. There are no lens-shift controls, but you can correct the vertical keystone using the included remote control, which is compact, works responsively with the menu and is backlit – which is handy in a dark room. Around the back you’ll find two HDMIs, composite and PC VGA inputs, 3.5mm auxiliary sockets for audio input and output, and a USB port too. The BenQ W1090 has its wobbles – motion instability, overly rich colours, a lack of subtlety – but it’s an exciting, engaging picture that’s easy on the eyes. The lush colours are appealing, but a dash more reality would allow it to really take the fight to its Epson rival. For its budget price, however, the W1090’s bold presentation, compact build and easy set up will win people over. If you’re on a strict budget, but want a big-screen picture, this BenQ is one to consider.